What if You Couldn’t Talk to Your Own Landlord? New York City’s Housing Authority has only six employees dedicated to managing language services across the 400,000-tenant system, and only two of them speak Chinese. Chu says she’s tried to request repairs with NYCHA, but the maintenance service has never fully fixed the issue; her kitchen floods regularly. Activists say that tenants like Chu suffer with shoddy housing conditions because the New York City Housing Authority (NYCHA) fails to provide language services they need for communicating about maintenance issues. The advocacy group CAAAV, which campaigns on behalf of working-class Asian American communities across the city, argues in a new report that the city has neglected the many Asian immigrant households residing in sprawling public housing projects, leaving them without comprehensive translation and interpretation services they need to interact with NYCHA staff and participate in the day-to-day functions in their communities. Resorting to the traditional “translation service” used by immigrants, nearly three in four respondents with unmet language needs “asked someone who did not work for NYCHA for help with interpretation”—in most instances, a relative; sometimes, a friend. NYCHA was supposed to establish comprehensive language services under a language-access plan launched in 2008 under Mayor Michael Bloomberg. The initiative included on-site and phone interpretation for staff and tenants, along with translations of housing authority documents into the more than 20 primary languages used by residents. 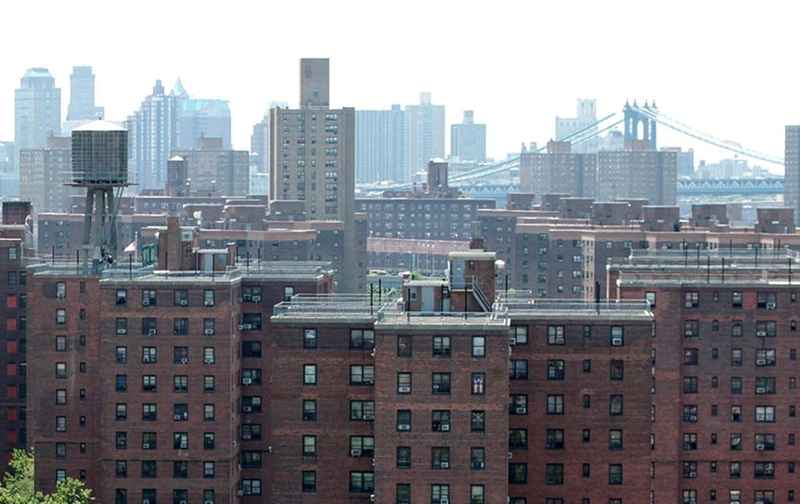 NYCHA also planned to conduct system-wide assessments of language needs and provide language-identification cards to help LEP tenants navigate the bureaucracy. But CAAAV found that to date there has been no “comprehensive census of NYCHA tenants” on language needs. According to CAAAV’s research, NYCHA has only six employees dedicated to managing language services across the system, covering some 400,000 residents across more than 330 projects. Just two of those staffers are Chinese speakers. Thomas Kim’s first introduction to the language gaps at NYCHA came about two weeks after he moved into his modest apartment at Queensbridge in 2010, in his late 70s. A pipe burst in his bathroom. It took repeated phone calls and bureaucratic inspection visits to get the maintenance personnel to make the repairs, he recalled. But during the months-long ordeal, his apartment became temporarily uninhabitable due to hot fumes leaking from the hole in the wall. The entire NYCHA system suffers from a massive repair backlog, generally leading to weeks-long waiting times for repair services, but Kim, who speaks only basic English, suspects the language barrier contributed to the staff’s unresponsiveness. CAAAV calls on NYCHA to fulfill its own mandate to provide comprehensive language access for all tenants. This requires hiring staff who speak Chinese, Bangla, Korean, and other languages in the Asian American community, rather than relying on volunteer efforts, as NYCHA has sometimes done, and ensuring full language competence in senior and disability services. More broadly, CAAAV calls for more resources to support translation services for NYCHA resident associations, so Asian immigrants can participate fully in community discussions on tenant issues. Kim wishes he could participate more at Queensbridge’s tenant meetings. He’s noticed the conversation is generally only in English or Spanish; he’d have plenty to say if he could use his own voice. If NYCHA listened a little more closely, though, they’d know that many immigrant residents who never seem to complain actually have plenty on their minds—they just don’t know how to say it.